Now if that is not exclusive or ….. or something … then I’m an invisibulean. Hey, where has everyone gone? 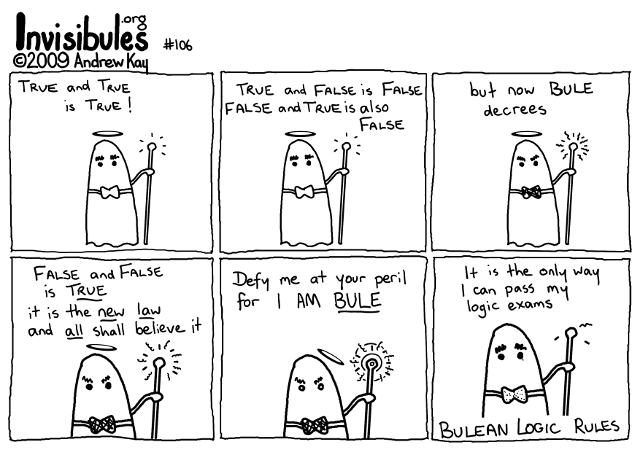 Bulean logic does indeed rule! Let’s assume that Bule speaks English’ (that’s English-prime) which is equivalent to English except that the word “and” means “xnor”. The translated sentence “False xnor false is true is the new law xnor all shall believe it” is consistent and correct and makes Bulean logic equivalent to Boolean. All hail the Great Bule, Creator and Master of Insvisibulia! sounds like something that george w. bule could’ve said.